The intense perfume of sea and flowers. The delicate flavors of olive oil and wine. Centuries of history that have survived time. Just a few kilometers from the French border, the gardens of Giardini Hanbury descend to the sea. Their international fame is due to Sir Thomas Hanbury and Lady Dorothy who created an extraordinary botanical garden of acclimatized exotic plants and Mediterranean vegetation. 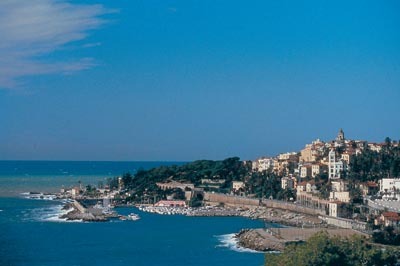 Next comes Ventimiglia, whose medieval old city is one of Liguria’s biggest. On its Piazza della Cattedrale you can admire the 17th century monastery, Monastero delle Canonichesse, the cathedral with its baptistry, the Palazzo Episcopale and the Old Town Hall. The archeology museum, G. Rossi Museo Archeologico, is worth the visit not just for its archeology but also for the view from its terrace – which goes from Cape Ampelio to Saint-Tropez. Events here abound. There is the Battle of the Flowers in June, and the historic procession of ”Agosto medievale” in August, with drummers and flag-twirlers competing in the ”Asteludo” ability competition and the “Ludum Balistre”, a cross-bow archery tournament, and in the “Regata” di San Secondo. The great Friday market attracts visitors from all over France and Italy. From the coast, heading into the mountains, the Valley of the Nervia leads to Dolceacqua, immortalized by Monet and famous for its red Rossese wine. The monumental ruins of its castle are joined to the village by a stone bridge that dates to the Middle Ages. Medieval tradition still appears in the San Sebastian procession in January carrying fir trees decorated with hundreds of colored confessional wafers, and on August 16 at the Festival of the “Michetta”, which reminds us that centuries ago, peasant brides were deflowered by their ruling lord on their wedding night as per the infamous "ius primae noctis" rule which was abolished in 1364. 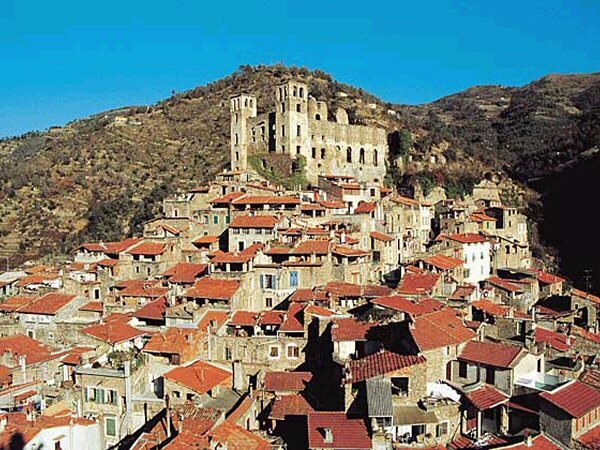 Next on the itinerary is Pigna, with an ancient fortress and steep alleyways called “chibi”, “darkness”, as they are covered by the houses above. The piazza around the castle, called in dialect, “la Kola”, is surrounded by houses with portals in sculptured slate. The ruins of the Benedictine abbey of San Tommaso are interesting, as is the parish Church of S. Michele and the Church of S. Bernardo, decorated by Canavesio in 1482 with the stories of the Passion of Christ and the Universal Judgment. The Ethnographic Museum of Peasant Culture gives a glimpse of the past in its five halls – shepherds, distillation of lavender, working of olive oil, weaving, and embroidering. Each year in August the Festival of Poetry and Comedy done in the local dialect is held here. At the posh spas of Pigna, the chloro-sulfuric hot springs of Assunta pour forth healing waters at 31°C. After Pigna, comes Apricale, famed for its summer theatre and its colored house facades, dominated by the heavy walls of the castle. The village is a maze of narrow alleyways, with pleasant Bed&Breakfasts and excellent little restaurants. At the center of the village is the parish church and the Oratory of San Bartolomeo. Further up is the Castle of the Lizard, which houses Apricale’s History Museum, along with sketches and posters done by the great illustrator and theatre scenery-maker, Emanuele Luzzati, who founded the “theatre of the cough”, Teatro della Tosse, in Genoa. In the summers, the theatre carries out open air shows on the piazza and in the alleyways. Local culinary delights are Taggiasche olive oil and fried dough dipped in hot zabaglione cream called “pansarole”. This specialty of Apricale has its own festival in August. Beloved of the English, Russians, and French, this Riviera town near the French border has hosted Queen Margherita of Italy and Queen Victoria of England. Margaret Serecold with her husband, Edward Berry, funded the Bicknell Museum and the International Civic Library. And Claude Monet painted Bordighera in more than 70 of his works. A small town of great and discreet elegance, Bordighera has beautiful villas and hotels in Art Nouveau Style, and cultivated a tourism of elites beginning in the 1800s. Its old historic quarter is dominated by Capo Sant'Ampelio and the church of the same name, the symbol of the town, and a new modern quarter that extends beyond to the hills and the sea. Worth seeing is the Oratory of San Bartolomeo, next to the Maddalena parish Church and the town hall, Palazzo Comunale built in 1783, designed by Charles Garnier. Its fountain is dedicated to Margiargè, the legendary slave girl who the pirate Boabil fell passionately in love with. She was kidnapped in Granada, but died in Bordighera. The many churches of many faiths testify to the love that foreigners hold for this Riviera town: the Church of Terrasanta with glass panels made in France; the Valdese Evangelical Church; the Anglican Church, today used as a multi-use cultural center. The Palazzo del Parco, the headquarter of the International Salon of Humor, is surrounded by a garden filled with palm trees and century-old plants. The beautiful sea promenade, Lungomare Argentina, was inaugurated by Evita Perón who spent some days here in July 1947. If you take the old Roman road, the Aurelia, from Bordighera to Madonna della Ruota, you can visit the gardens, Giardino Esotico Pallanca, on a steep cliff above the sea. It holds the most valuable collection of cacti in Italy, along with 3,200 other types of plants.